Evil awaits you in the old swamps of Louisiana. With an unsettling vibe that’s so thick you could cut it with a knife, Hunt: Showdown offers shooter fans an experience that is wildly different from the norm. The game’s unique approach to combining PvE and PvP scenarios while mixing in some of the creepiest moments of the year helps it lock down the award for Best Early Access Game of 2018. Hunt: Showdown has a complicated development history that spanned multiple teams and continents. Originally announced as Hunt: Horrors of the Gilded Age, the game was being built by veterans from the original Darksiders team that made up Crytek USA. When the studio ran into money trouble, the operation was shuttered and development on the game was transferred to Crytek’s headquarters in Germany. It resurfaced in late 2017 under its new name, Hunt: Showdown, and had an official launch onto Steam Early Access in February of this year. The game centers around groups of bounty hunters that travel deep into the muggy, unforgiving swamps in search of otherworldly creatures. If they manage to cleanse the land of these beasts, they will receive a reward of gold, but simply earning the bounty is not enough. Hunters who manage to slay the beasts and collect the bounty must escape the swamp under pursuit from the remaining bounty hunters who remain in the session. Should players manage to escape with the bounty of gold, the windfall can be spent on outfitting their hunters with improved weaponry for additional runs. All players who perish during a session lose everything, though the experience earned is retained through a mechanic the game refers to as the Bloodline. Experience earned from one hunter is passed down to the pool of hunters in the Bloodline. Hunt: Showdown is always a balance of risk and reward. Unless you want to attract the attention of other players or the various monsters that inhabit the swamps, discretion is advised. Sound is incredibly important in Hunt: Showdown. Extreme care must be taken with all things you do, as something as simple as the creaking noise from stepping on a wooden plank can be enough to give away your position to other players of monsters. Should you be successful in killing the targeted monster, you must still banish its soul to complete the bounty and get paid. This process alerts all other players on the map and any of them can take the bounty once the banishing process is complete. One wrong move and you could lose everything. The unrelenting tension is the star of the show in Hunt: Showdown and what will keep players coming back for more. It should also be mentioned that the game looks very good, which should come as no surprise to those who have enjoyed past Crytek games. The studio was responsible for Crysis, the game that pushed graphics so far forward, it tooks competitors years to catch up. 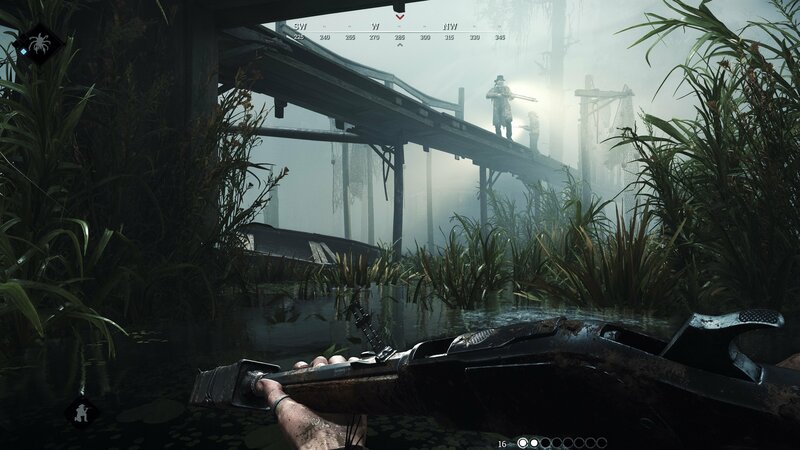 Running on an updated version of the CryEngine, Hunt: Showdown has nearly every graphical bell and whistle you can think of, all working in service of delivering an unsettling experience in the murky Louisiana swamps. It will require a beefy PC to make the most of its breathtaking visuals, but PC gaming veterans understand that this is par for the course. As the game works towards a final release, it has received new maps, hunters, gear, and monsters. As expected, the game gets regular balance adjustments and bug fixes as a part of the early access process. While Hunt: Showdown is still technically in the oven, the team at Crytek have already delivered a horrifying shooter experience that draws you back in for more. For this reason, it takes the top spots as the Shacknews Best Early Access Game of 2018. Don't miss out on the best video games of 2018 — head over to the Shacknews Awards 2018 home page to brush up on our picks for the very best games to release this year.